VLT has a range of Speedometer Testers from 1500 kg, 6000 kg up to 14000 kg, developed for intensive and heavy use in Automobile Test Stations. All models consist of 4 special coated rollers of which 2 rollers are connected by a propeller-shaft on which the electronic pulse counter is fitted. The signals are sent to the Speedometer controller. The results are displayed on a 22"TFT-LCD monitor. The software is standard or tailor made. The VLT 1885 and VLT 3885 are available with a taximeter conversion. This means that in a taximeter configuration an electrical motor is driving the rollers, ensuring that the reading is very accurate (less sound and no emissions). All models are very robust and can be classified as top of the market, with high value for its price, fitted with a fast hydraulic lifting system which locks the rollers when the lift is up. 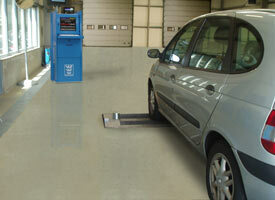 The 14000 kg version has an independent roller braking system. A hydraulic lifting system is more expensive as the common pneumatic system, but more powerful and more reliable, especially with heavy use of the Speedometer. 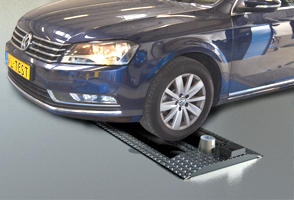 The Test Lane version has a drive-in place sensor device for full automatic use and safety protection.